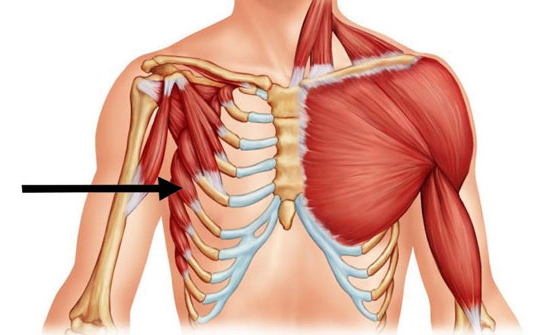 These are your Serratus Anterior muscles. 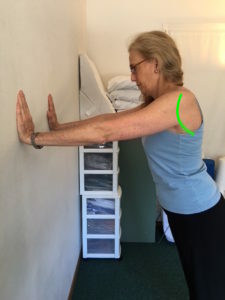 They are mainly a Scapular stabilizer but they are also involved in the protraction and rotation of the Scapula. 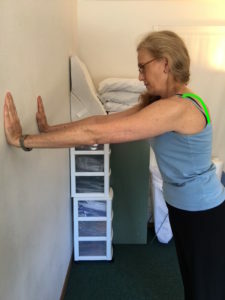 Below is a guide to a Serratus Anterior exercise that you may be able to perform at home. 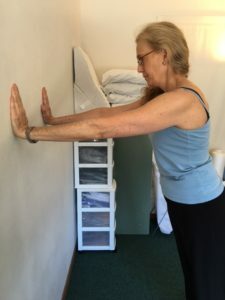 When doing this exercise you will want to start in a neutral position. 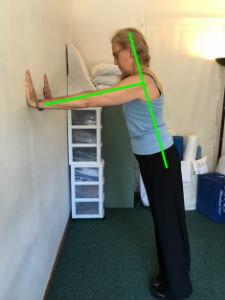 As you can see from the picture below– your head, back, and hips should all be in line with one another. Your arms should be extended in front of you- forming a 90 degree angle with the rest of your body. Allow yourself to come back to a neutral position – while still maintaining your line and 90 degree angle. Then, allow your body to come in towards the wall. Do not bend your elbows. Keep the same alignment of the rest of your body! As always, be gentle and listen to your body!